DeepakS. Bansal Memorial Award: This award is given to the student of the college passing the T.Y.B.Com. Examination with the highest aggregate marks. Bhailalbhai J. Patel Merit Prize: (Donated by the Malad Sanstha Congress SarvajanikTrust, Malad). This award is given to the student of the college who passes the T.Y.B.A. Examination securing the highest aggregate marks. Ramanbhai Patel Merit Prize: The prize is given to the winner of the Gujarati Sahitya Mandals Sugam Sangeet Competition. Sheriff Lion AshokMehta Excellency Award: This award is given to the Best Student of the College for outstanding overall performance. Shri Dattatraya Anant Thakur Memorial Prize: This prize is given to “Best Sportsperson of the Year" in the Degree College. Shri Ajit Ram Ailawadi Memorial Prize: This prize is given to the student of the college securing highest marks in the subject of Business Law in S.Y.B.Com. The Sane Guruji Memorial Prize: for Marathi subject in Arts stream of University of Mumbai. This prize is given by Mrs. Shraddha Daggaonkar to the B.C. 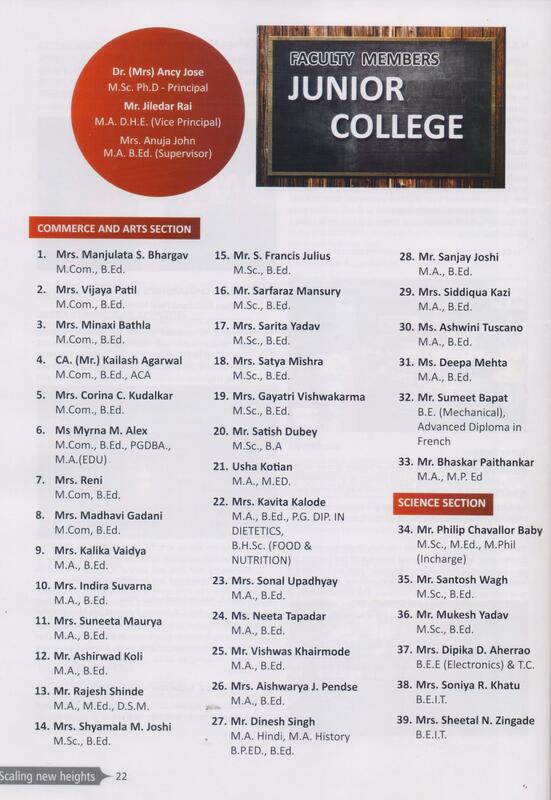 Girl student of the Arts stream of the college, securing the highest marks in the Marathi subject examination of University of Mumbai. Shri Choonilal Girdharlal Memorial Prize: Choonilal Girdharlal Foundation gives this award to the student of the college passing the T.Y.B.M.S. Examination with the highest aggregate marks. M/s. K. Dipen & Co. Prize: Prize for Toppers in Accounting subject. Smt. Panna Shukla prizes: For Girls for recognition at State/National level NCC/NSS/Sports (Two Prizes) For the Best Original Article by a student, selected for Niharika For the Best Student in recognition of Oratory Skills or Singing.